Microsoft will drop integration for Facebook and Flickr from the Photos app in the next version of Windows. A Microsoft representative confirmed the changes in response to complaints in the company's forums, as spotted by The Verge. 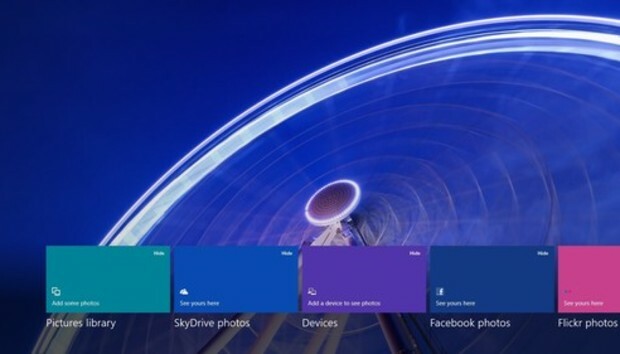 In addition, the Photos app in the Windows 8.1 preview (see above) no longer shows images from network storage or from SkyDrive, but these changes haven't yet been confirmed as permanent. "In Windows 8, we wanted to provide a way for folks to view their photos on other services, knowing there would be few (if any) apps in the store at launch that would do so," the representative said. "Now there are many apps in the store that offer ways to view photos on other services, and soon there will even be a Facebook app from Facebook." The Photos app in Windows 8.1 has a completely different interface than it does in Windows 8. Instead of offering five categories of photos--local storage, SkyDrive, Devices, Facebook and Flickr--the new system looks nearly identical to the "file picker" that other apps use. But there's one big difference: In other apps, the file picker lets you choose files from other sources, including SkyDrive and networked devices. You can even expand the number of sources available by downloading supported Windows Store apps. For instance, downloading the Box app allows you to pull files directly from that service when attaching files in other apps, such as Twitter and Mail. In the Photos app, however, local storage (referred to in the file picker as "This PC") is the only available source for images. It definitely seems like a step backwards for Windows 8, which once touted a greater amount of connectivity between apps.